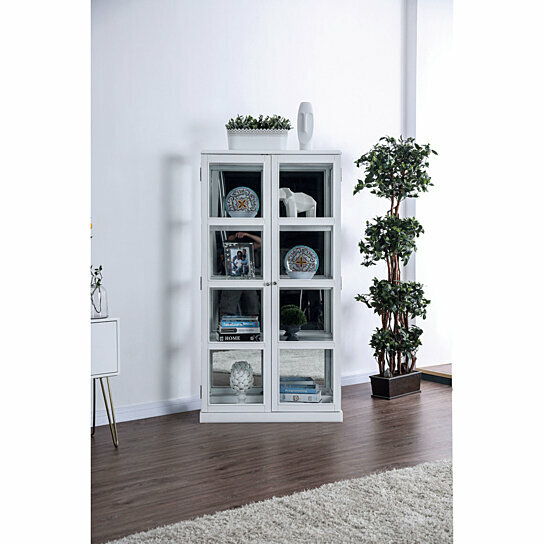 This multi-purpose curio cabinet is a combination of four shelves between two glass doors. Wood and glass constructed structure giving you a multiple storage options so that you can organize your important things systematically. Featuring a white finish, the two door consists metal knobs for easy opening. Cabinet top can also used to keep other decorative giving decoration an airy look. Use this exemplary addition in any space of your home to give quick access to your things with giving a warm inviting feel to the decor.